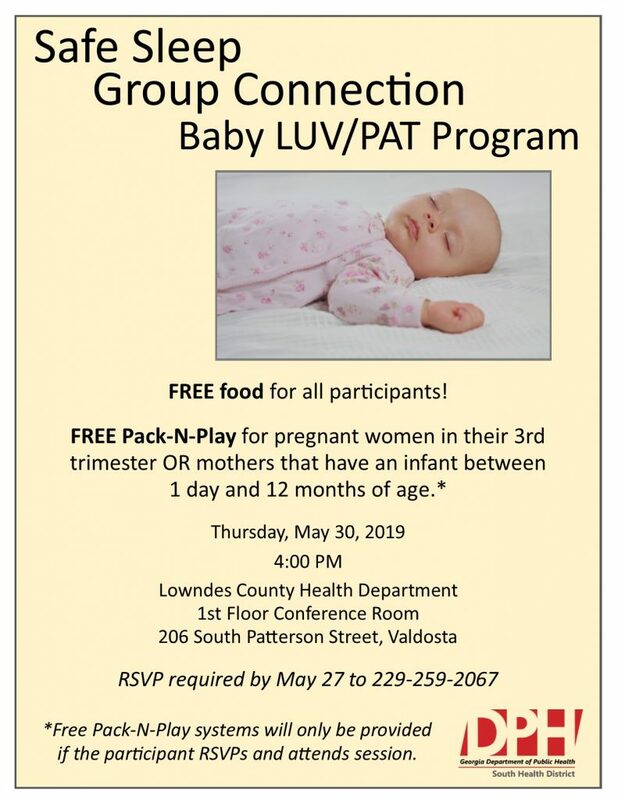 VALDOSTA – The Baby LUV/PAT Program is hosting a Safe Sleep Group Connection class on May 30, 2019. The educational event will offer tips on safe sleep practices for babies. Pregnant women in their third trimester or mothers with an infant between one day and 12 months will receive a FREE Pack-n-Play if they RSVP and attend the session. The session and the free Pack-N-Plays are only open to the first 30 people to RSVP. Free food will also be offered to all participants. The event will be held at the Lowndes County Health Department first floor conference room, 206 South Patterson Street. RSVP by May 27 by calling (229)259-2067.